Missing OCCC work furlough inmate Travis Massey captured. Faces an added escape charge. Missing work furlough inmate Travis Massey was captured by Honolulu Police at about 4:20 p.m. He was wearing an electronic monitor. With the help of OCCC staff relaying coordinates, HPD was able to track him in Waikiki and arrest him. 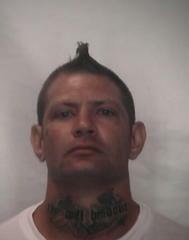 Massey failed to return after work to Module 20 at the Oahu Community Correctional Center (OCCC) at 3 p.m.